Following the methods of Triphasic Training and the goal of applying maximal stress on specific adaptations from training, the three phases that occur in every dynamic contraction, eccentric, isometric, and concentric, are trained on an individual basis. A previous article “Supramaximal Slow Eccentrics and the Safety Bar Split Squat” explained the training ideologies, reasoning, and implementation of supramaximal training in the eccentric phase. As laid out in the previous article, the stretch-shortening cycle (SSC), which is utilized in every dynamic movement and consists of the eccentric, isometric, and concentric phases, is one of the most important aspects of training and is the focal point of Triphasic Training. Once the eccentric phase of contraction has been improved through specific, supramaximal training, the isometric training phase is implemented to continue the optimization of the power and efficiency of the SSC. The isometric phase of movement is absolutely critical for the optimal transition between the lengthening and shortening of a muscle in contraction. Without the training of this phase specific to movement requirements, every athlete will lose potential free-energy from the SSC in each completed action in training and competition. This reduced free-energy leads to inefficient movement and reduced power production. If the “V” shape, used in the previous article and shown again below in Figure 1, is readdressed, the eccentric and concentric muscle actions of dynamic movement become clear, while the isometric action is commonly overlooked as it is not clearly portrayed within the “V”. 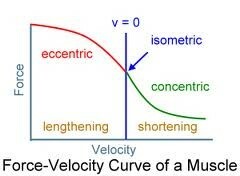 The isometric phase occurs in the brief amount of time as the muscle shifts from the eccentric to the concentric action. Amortization is another term that has been used for the isometric phase of dynamic movement. A knowledgeable coach, one who has utilized the supramaximal eccentric training outlined in the previous article, understands the eccentric portion of the “V” now has the ability to occur at a steeper slope due to the increased ability of the body to absorb high forces. This enhanced capability of the muscle and tendon components of the body to absorb force leads to a greater potential ability to store free-energy within the elastic components of the musculo-tendon structure. However, unless the isometric phase of contraction is trained appropriately, this enhanced ability of these elastic components to produce force in the concentric manner will be diminished. As the isometric phase becomes trained, the amount of free-energy that can be transferred from the eccentric to the isometric and finally through the concentric muscle action is improved. It is only through the specific training of each of these dynamic muscular contraction components that the efficiency of the body and power production can be truly optimized. Now that the importance of the isometric phase of dynamic muscular contraction is better understood, it is necessary to address the specifics of training this phase to the greatest extent. Figure 2 below depicts the force-velocity curve of a muscle depending on the specific phase the muscle is experiencing. In the previous article discussing supramaximal training it became clear that in order to truly improve the eccentric, force absorbing capabilities of the musclo-tendon structure, loads greater than the concentric 1RM of that movement must be used. If lower loads are used the adaptations seen in this phase of movement will not occur to the greatest extent. The same principle applies to the training of the isometric phase. Although the isometric phase is weaker than the eccentric phase, it is still able to produce higher force values than concentric muscle actions. For this reason, supramaximal loads are continued to be used throughout the isometric training block in Triphasic Training. This training is completed specifically to maximize the ability of this brief, yet vital portion of dynamic movement and the SSC. Once again it should be noted this supramaximal eccentric training should be used only with highly advanced athletes and a spotter should be used on both sides of the bar at all times. The “V” graphic in Figure 1 has already been referred to in the previous section, but its importance to performance enhancement cannot be overemphasized. If the isometric phase, which can be easily overlooked in training, is not maximally trained, an athlete will do a poor job of transferring the energy stored from the eccentric phase into power; especially if the eccentric phase has been maximized as explained in the previous article. When the isometric phase is overlooked, the steep “V”, which is the goal, as increased force is produced in less time, may end up looking more like “\_/”. Clearly this second shape is less than ideal as it takes a greater amount of time to reach the concentric phase, thus less free-energy from the SSC is transferred and is lost. Supramaximal isometric training continues to lead to high quality tissue adaptations to the muscle fibers being trained. As there is no muscle length change in isometric movements, velocity of contraction is zero and is not considered in training. This means the amount of time spent in the desired position and load used are the determining factors of adaptation in this training method. By training isometrically in a supramaximal fashion, greater tissue adaptation is realized within the muscle. This adaptation occurs as muscle fibers are fired and re-fired throughout the duration of the repetition to the greatest extent with supramaximal loads, even though no movement is occurring. The adaptations occurring within the tissue through this training maximizes the free-energy that is transferred throughout every dynamic muscle contraction and the SSC. As introduced above, with zero length change in the muscle during isometric muscle actions, the two primary factors in determining stress in this training method include the load utilized and the duration of each completed set. With loading parameters already being set according to the supramaximal training used in this muscle action phase training, only the time of each set remains as a parameter affecting this training. With the goal of training with high-quality at all times, sets are kept below ten seconds in the Triphasic Training Program. By keeping this time low and allowing brief rest between all movements energy utilization is reduced in training ultimately leading to mTOR, or muscle building abilities, being enhanced. Adaptations outside of the musculo-tendon structure also occur within the supramaximal isometric training model. As with the supramaximal eccentric training, supramaximal isometric training leads to the greatest hormone response within the body due to training. This is due to the high stress levels applied in this training protocol. This increased hormonal response continues to enhance the adaptation processes occurring within the athlete. A second, more centralized, adaptation that has been seen due to this training model is improved efficiency within the cardiac output system. This could be due to multiple factors in this training program, but it is believed to be due to the high pressures placed on the cardiac system that lead to this improved efficiency. Figure 2 below solidifies the training mechanisms used within the Triphasic Training System to specifically train the isometric phase of any muscle action. In order to train the isometric muscle action phase to the fullest extent, which is the main purpose of this method, loads must be high enough to stress the isometric phase. It is with this idea in mind that supramaximal loads are continued through the isometric training block. Supramaximal loads must be used if the isometric muscle action phase is to be stressed and improved to the greatest extent, which must be the purpose of training in this block. The same exercise used in supramaximal isometric training as was used in supramaximal eccentric training, the hands assisted, safety bar split squat. As described in the eccentric article, this training exercise has been found, at this time, to be the optimal movement to induce total body stress. By training this exercise in all three muscle action phases, efficiency and power outputs are increased in single leg movements. 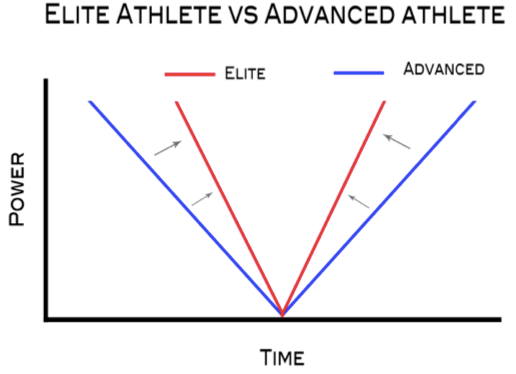 This leads to greater transfer of training to sport, which is the ultimate goal of all training. The hands assisted aspect gives a better support system and takes pressure off the back, which is usually the weak link in squatting exercises. The support of the arms also allows single leg training to be used without balance becoming an issue. Once again the goal of the program is to maximize stress on the body, the hands assisted, safety bar split squat allows for this and leads to the necessary adaptations for enhanced performance. Supramaximal isometric exercises, such as the hands assisted, safety bar split squat described above should only be used in the first training block of the day. If supramaximal loads are used for more than one exercise, or too many sets with these high loads are completed, too much stress will be placed on the body, leading to performance decreases. Supramaximal isometric exercises can be used as potentiation exercises, just as the supramaximal eccentrics were in the previous phase. This potentiation leads to increased rate of force development during plyometric movements, such as the French Contrast Method. Supramaximal isometric training can be applied in any manner that you desire as a coach, you can even keep the exercises you are already using within your program. The coaching point used for the hands assisted, safety bar split squat will be the same as in the supramaximal eccentric article, other than the exercise is now being completed strictly as an isometric exercise. Focus is still placed on the back, chest, and leg positioning. The back should be kept in a neutral, supported position with the chest up. The front leg position should be around 90-90, with the back leg at an angle slightly extended beyond 90 degrees, be sure the back leg does not become too extended, as it will begin to pull the athlete’s hips out of proper alignment. Another key coaching point in this movement is teaching athletes to push through their back leg and fire that corresponding glute. This leads to increased stabilization of the pelvis while also utilizing the correct kinetic sequencing for athletes. To begin the set, the athlete will move from the starting position into the bottom position in a controlled motion. Once the athlete has reached the bottom position, the timed set will begin and the athlete will hold the bottom position until the set is completed. The athlete is encouraged to begin every isometric lift with a belly breath and then hold their breath for the duration of the rep. This is believed to cause greater adaptations within the circulatory system, as discussed earlier, and will be covered thoroughly in a separate article. Just like the eccentric phase, spotters will be required as the supramaximal loads will be too heavy for the athlete to lift concentrically on their own. We suggest a spotter on each side of the bar for these supramaximal load movements. The athlete will continue to focus on exploding out of the bottom position concentrically when the set is completed, even though the load will be too heavy for the athlete to lift completely on their own. The three phases of every dynamic muscular contraction must be trained individually based on both their physiological and force producing capability differences. Based on the differences shown in Figure 2 supramaximal training is necessary to train both the eccentric and isometric phases of contraction to the greatest extent. Isometric strength, when maximized, allows for the optimal free-energy stored throughout the eccentric phase of the SSC to be converted into power through the concentric phase, which is the ultimate goal for athletes. The stress imposed on the body using supramaximal loads during isometric contractions allows the maximization of this second phase of the SSC. Supramaximal isometric training will continue to strengthen the tissue, which was also done during the supramaximal eccentric phase of Triphasic Training. To this point the greatest adaptations have been seen using the hands assisted, safety bar split squat which maximizes stress on the body. This controlled stress leads to increased adaptations, and ultimately maximized performance. After the isometric phase of Triphasic Training has been utilized properly, an athlete is now prepared for the reactive phase of Triphasic Training. This final phase of Triphasic Training’s specific muscle action phase training will put all 3 components of the SSC together and the free-energy transfer through the SSC will be maximized to steepen the “V” even further. This steepening of the “V” will continuously lead to a more explosive and efficient athlete.